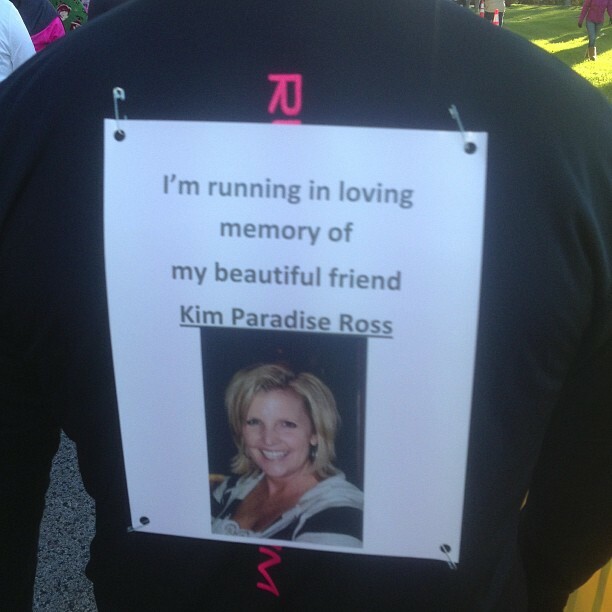 The picture on the back of our race shirts reads “I’m running in loving memory of my beautiful friend Kim Paradise Ross.” It is difficult for me to feel comfortable with calling myself a “friend” of Kim. Looking at one possible definition we find the meaning as “one attached to another by affection or esteem”. In today’s virtual society the term has become so watered down that its value more closely resembles acquaintance, and it is there that my comfort level is found. Friend is a title to be earned, not assigned. Kim succumbed to breast cancer July 8th of last year. My memories of her are primarily grounded in our teenage years. She and I attended Fort Caroline Middle School and Terry Parker High School. While we did not necessarily run in the same social circles Kim’s personality elevated her above the social cliques. It was not difficult to be drawn to her smile and undaunted optimism, things she shared with all who drifted into her path. After graduation she became nothing more than a yearbook photograph but one not forgotten. Last year a mutual friend of ours, Amanda Farmer, asked me to participate in the Team Kim Ross relay for the 26.2 with Donna. When Amanda gave me the back story it was impossible to say no. Kim had fought and overcome the cancer but was now in the throes of a second attack, one which would be described to me as virtually insurmountable. Both the pre and post race feasts were a mix of joy for the cause and sadness for the reality that this would probably be the last race Kim would run. Beaches Labor Day 5K Run with F.R.I.E.N.D.S. Nitzer Ebb fans will get the title. They may also remind me the meaning of the song is probably not where I am going with this piece. And they would be correct. However the title alone does serve my purpose of pointing out the many ways in which you can satisfy both your need to get fit and to give back. Years ago my good friend Chuck Schoonmaker asked me to participate in Jacksonville’s Gate River Run. A 15k (with a nice bridge at mile markers seven and eight) seemed an impossible task but together we made it through. Now our pace was just fast enough to beat a snail but that was not the point. For me it was a watershed moment of proving what I could do physically. That is not to say I was a lethargic sofa cushion. I played in a flag football league and engaged in a pick-up game of basketball from time to time. But participating in an endurance event requires a different degree of commitment and mental strength. Once I had the Gate bug, running became part of my life routine. It was not until my friends Brian Thompson and Joe Peters approached me to take a leg of a sprint triathlon that I really began to understand what the draw was to these type of events. The interesting piece was not so much the sense of satisfaction you get from crossing the finish line (especially at a better time than your last) but also the sense of community and the inspiration from the other participants. 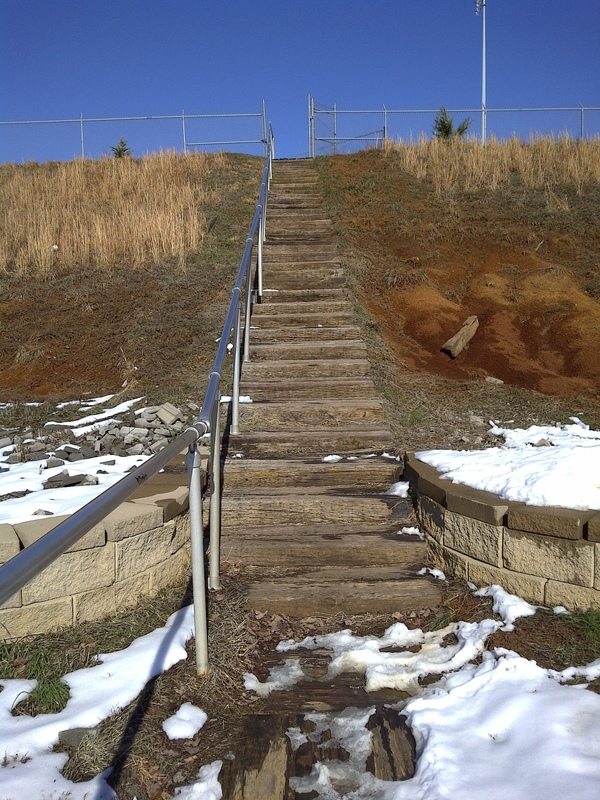 For example, after I finished last year’s Gate I fueled up and found a spot about 50 yards from the finish line. I wanted to cheer on my wife and our friends as they came by. What I was also witness to were pairs of obese competitors pushing each other to success along with few who fell along the route. Those injured, while bleeding and limping, had just as much intent on their faces as those who had finished much earlier.